Porsche is upgrading the Macan. To coincide with the world premiere of the Macan GTS at the Tokyo Motor Show, the new model year of the SUV is also receiving enhanced infotainment and comfort features. The technology highlights at a glance. The new Porsche Communication Management (PCM) now comes in the Macan as well. Just a short while ago, the system celebrated its debut in the 911. Highlights are real-time route navigation, simplified operation and an integrated Wi-Fi hotspot. Porsche is also offering new full-LED headlights as an option for all models of the sporty SUV. Greater comfort and functionality are augmented by a bonus in sportiness. A re-engineered steering controller provides a more direct handling experience and improved contact with the road. 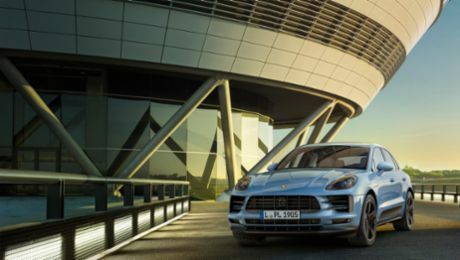 Extended exterior and interior packages are available as options exclusively for the Macan Turbo. Now customers can introduce even more individual styling to their vehicle. Inspired by the GTS models, Porsche is for the first time offering additional exterior and interior packages for the Macan Turbo. A variety of design elements on the body give the powerful SUV an especially sporty touch. 21-inch wheels in 911 Turbo design gleam in their exclusive bi-colour design. Dynamically styled Sport Design door mirrors and wheel hub covers with coloured Porsche crest add further accents. Contrasting elements in high-gloss black decorate the air inlets and side blades, as well as the trim strips on the side windows and the rear underbody panel. Blending harmoniously with the colour scheme of the Sport Design lower rear apron, the sports exhaust system features black tailpipes. Smoked rear lights round off the individual appearance of the top model. In keeping with the tradition of GTS models, Alcantara trim and contrasting stitching indulge sporty drivers with an especially high level of aesthetic and haptic quality. Alcantara is a familiar material from motor racing that covers the centre panels of the seats as well as the armrests of the centre console and door panelling. Decorative stitching in Rhodium Silver or Garnet Red on the instrument panel, seats and door panels provide for additional highlights. Turbo lettering on the headrests in contrasting colours and illuminated carbon door sill plates announce the performance potential of the 400 hp (Macan Turbo: Combined fuel consumption: 9,2 – 8,9 l/100 km; CO2 emissions: 216 – 208g/km) premium SUV even while it is stationary. Both packages can be ordered independently of each other but both unite sporty design with exclusivity. Moreover, new exterior paint colours are available for all Macan versions. Decorative stitching in contrasting colours and centre panels of the seats in an alternative colour leave even more scope for individualisation. In addition, the optional Alcantara-trimmed steering wheel supplies extra comfort during the winter period thanks to steering wheel heating and provides excellent grip for a sporty driving style. Smartphone, smartwatch, and car unite to form a mobile network. 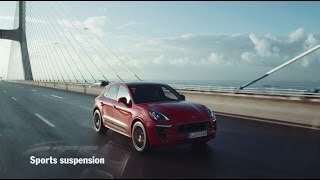 The new Macan GTS – Life, intensified.